The Aberdeen Area Indian Health Service (IHS) provides health services to approximately 122,000 Indian people who reside within nineteen service units. 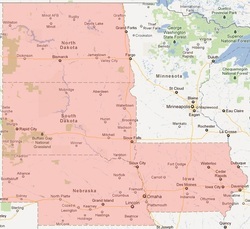 There are sixteen reservations: eight in South Dakota, four in North Dakota, three in Nebraska, and one in Iowa. There are also three non-reservation service units: Rapid City, South Dakota, Trenton Service Unit in North Dakota, and Northern Ponca Service Unit in Nebraska. The Aberdeen Area IHS also provides health services to approximately 6,000 Native Americans who are not counted in the user population of the Area. This population does not reside within any service unit; however, they meet the IHS eligibility criteria for health services provided at IHS or Tribally operated direct care facilities. The largest concentrations of the non-service unit eligible are found in Aberdeen and Sioux Falls, South Dakota and Bismarck and Grand Forks, North Dakota.